Shining Your Light for Him was a perfect theme for this year’s retreat. You can be a Baptist, a Catholic, an Episcopalian or Charismatic and if you let it, Christ’s light will shine through you. There is no partiality with the Lord. 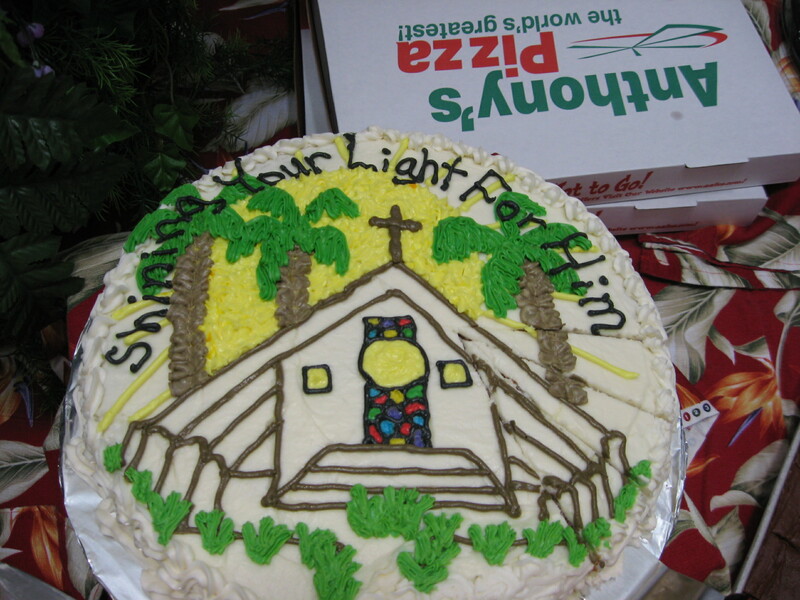 I saw Seventh-Day Adventists Spirit-filled worshiping God, Baptists praying next to Lutherans, a Methodist singing while next to them a Charismatic worshiped God with hands raised…and this was in the local church on Kwajalein, not just the missions group! This was the unity of the Body of Christ like I had never experienced before in my life – it was beautiful, humbling, anointed and I was awestruck at the beauty of Jesus. There will be a Church, too large to contain in structural buildings, that is comprised of people in unity, reaching beyond denominational lines and it will be spread throughout all cultures, crossing over oceans with no more fear of each other or of not being accepted by one another. If we are in Christ, we are all accepted. His Church is comprised of His servants not mine. Some may say, ‘Ashley, this really is not practical, not possible, not rational’. That’s good. I like to hear that. Because God never does what is possible. Only what is impossible. Some may also say, ‘but we already are the Church, there’s nothing else to attain to.’ But I’ve seen (and myself partaken in) too many disputes, too many derogatory remarks concerning different denominations’ beliefs, from all sides, to believe that we have attained to unity the way the Holy Spirit originally intended. Or do we think when Paul urges unity and peace between the brethren that it was intended only for the members within one church building? They didn’t even have church ‘buildings’ before ~ 230 A.D. In Romans chapter 14, Paul tells us, and I paraphrase, let not the one who eats [moves freely in all the gifts of the Spirit] despise the one who abstains [is unable to accept everything God has for them at this time.] And let not the one who cannot accept pass judgment on the one who moves freely. We have yet to attain to this. But I have resolved to change my perspective and my confession on this matter. I will welcome those who are weak in faith and those who are strong in faith without passing judgment. It’s profound. Who could take millions of individual humans, with their individual tastes for worship, their own desires, their complex personalities and preferences, perspectives and pursuits and forge them into one body, one working organism, with one heart and one mind? Taking on the very appearance of God Himself as He willed in His word would happen; who but the living God could do this? And the question remains, has it yet been done? There is freedom here somewhere, between the lines our denominations draw in the sand, which send a perpetual message of, don’t cross if you don’t intend to believe like we do. But there is no question, it will happen, it is only a matter of time. This fragmented Church will reconnect and function as one unit. A few of us convening during breakfast. Clockwise from noon: Lenka, Nyasha, Trecie, me, Justine, Malte. Day 2: After a light breakfast Sunday morning, we headed off to the Micronesian and Marshallese Cultural Shop – wow, we were there for nearly an hour in these tiny stores simply because it had been so long since we’d had the privilege to ‘shop’. 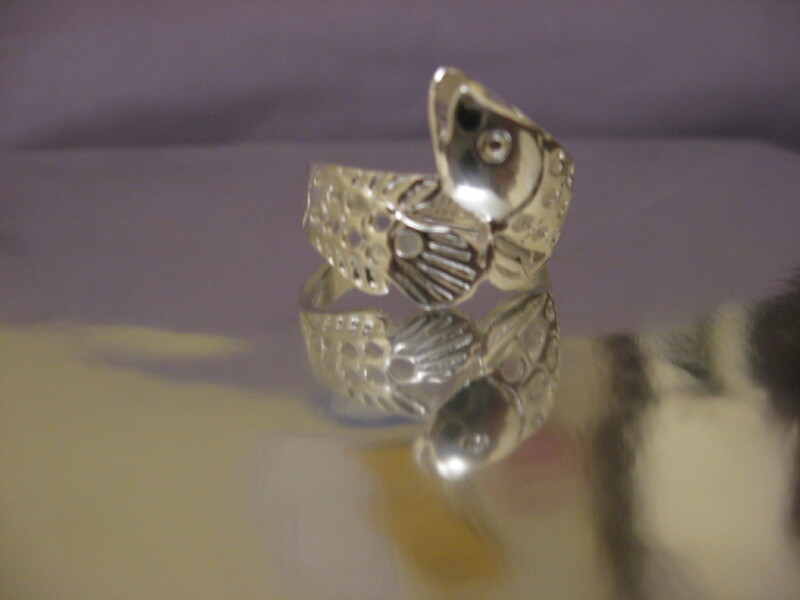 And since it was my birthday, I got a little present from my missionary friends :) A silver fish ring. Thanks Gem Ministry Team! You are such a blessing. 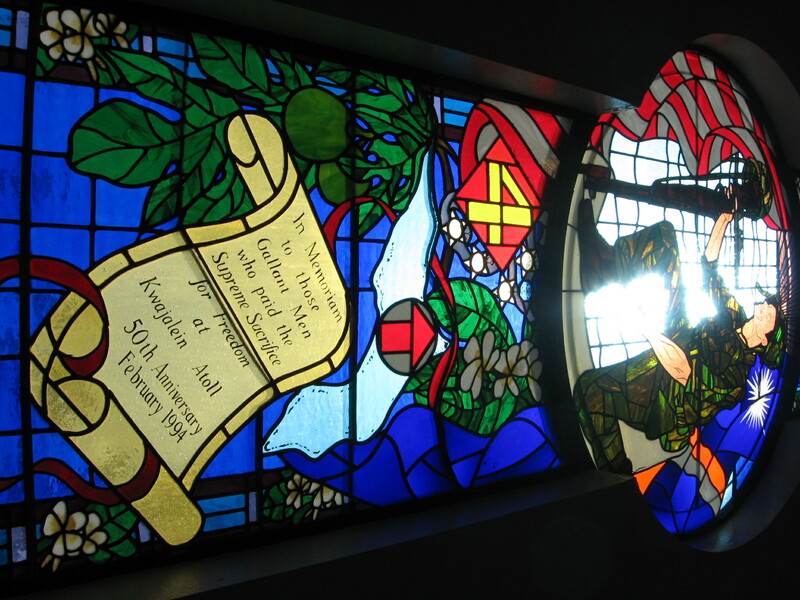 We headed back for church and I snapped a pic of this beautiful stained glass window at the back of the chapel. The church has a long, sloping roof. Other than that, it is open which is good because it really gets hot down here when there is no wind. 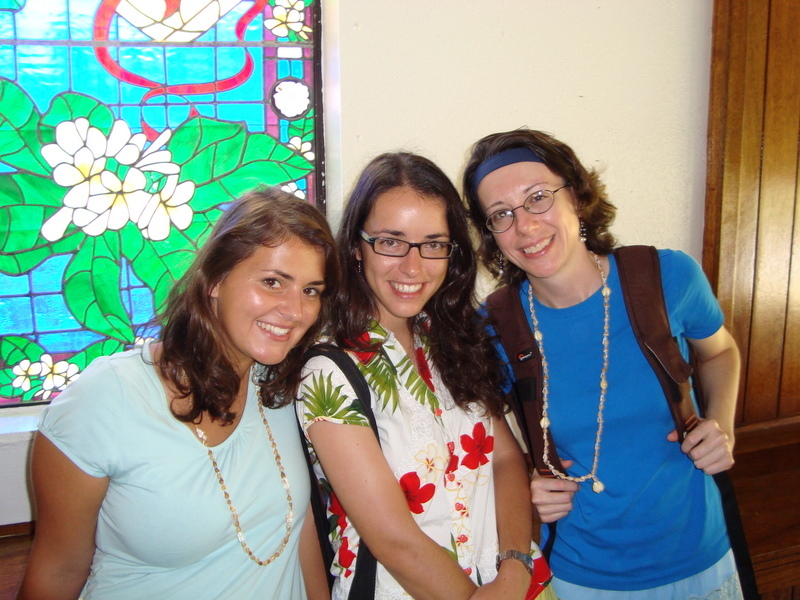 From left: Helga from Germany, Lenka and me. After service, the ladies spread out a huge buffet for us. It was soooo delicious! I also got a surprise Happy Birthday song from everyone…God is good. 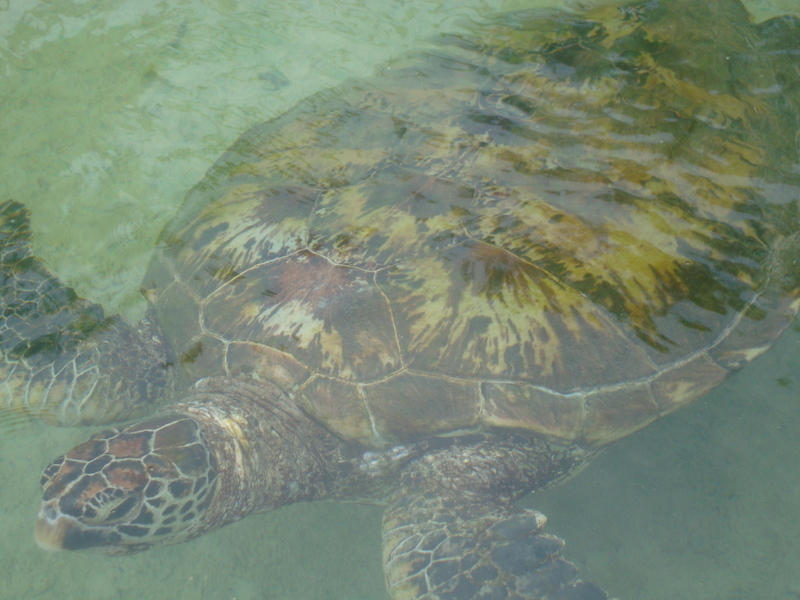 We then headed out to tour the sharks, sea turtles and eventually, Subway! Sharkfest Viewers. From left, Lily, Love and Michael, Trecie, Pauley and Peter. 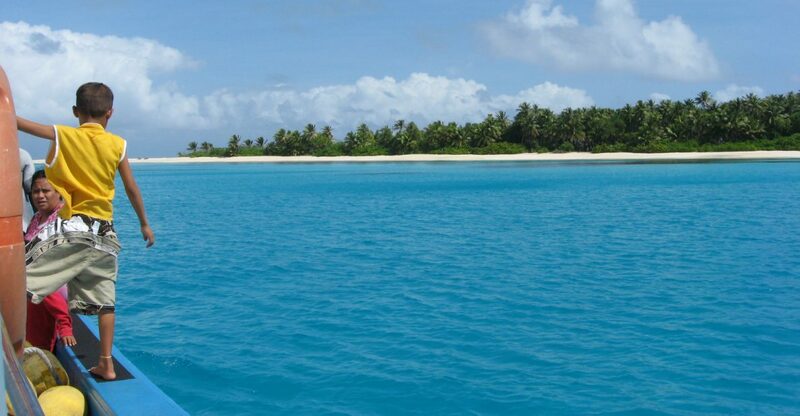 The Kwajalein lagoon is infested with these things because the Marshallese do not fish them. 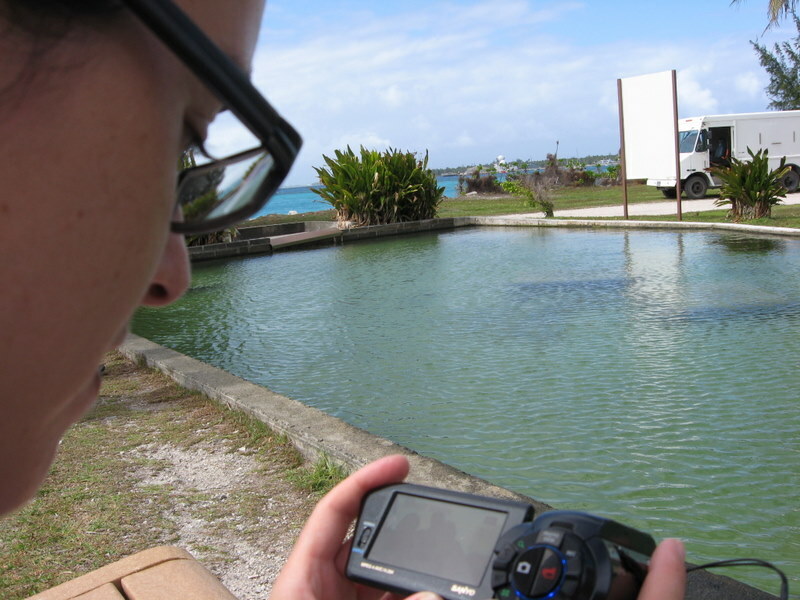 I think I’m going to start praying about that…I’ve heard more shark stories in two days on Kwaj than I’ve heard all 8 months on Ebeye. I think Americans are obsessed with Jaws! A pic on the bridge over the turtle pond. From left; Lenka, Jonas, Love, Michael, Lily and James. What a blessing this retreat has been for all of us. It was refreshing and God opened my eyes to a lot a beautiful things. My next post will be the ‘part 4’ conclusion to this series. I hope I will have gotten at least some of what was on my heart across to you. I’m excited for the church in the coming decade! Unity. Who wants it, right? People usually don’t want to conform, bring into harmony or agreement, be or become similar to each other because they fear, somehow, they’ll lose a certain amount of control. It’s all about being independent and different from everybody else. Our focus, it seems, has been on the pursuit of individuality while ignoring the more important matter of being in harmony with one another as Jesus and later Paul urged us to be. But the unity I’m talking about is not dressing alike with dead, dull personalities and a boring gray uneventful life to live. 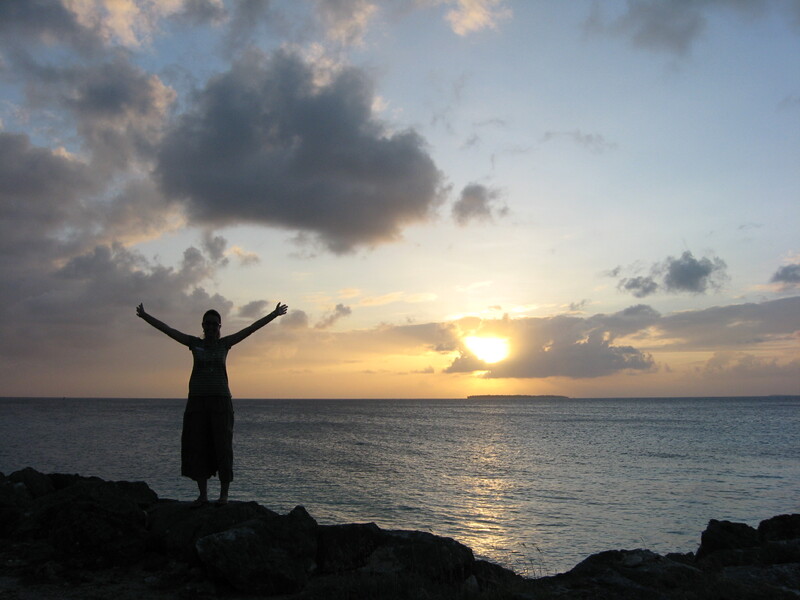 There is no greater adventure than knowing God to the fullest extent. With Him shining through a life, that person becomes exquisitely beautiful, a mystery, uncontainable and unstoppable in the pursuit of godliness and holiness. One of my favorite pictures. 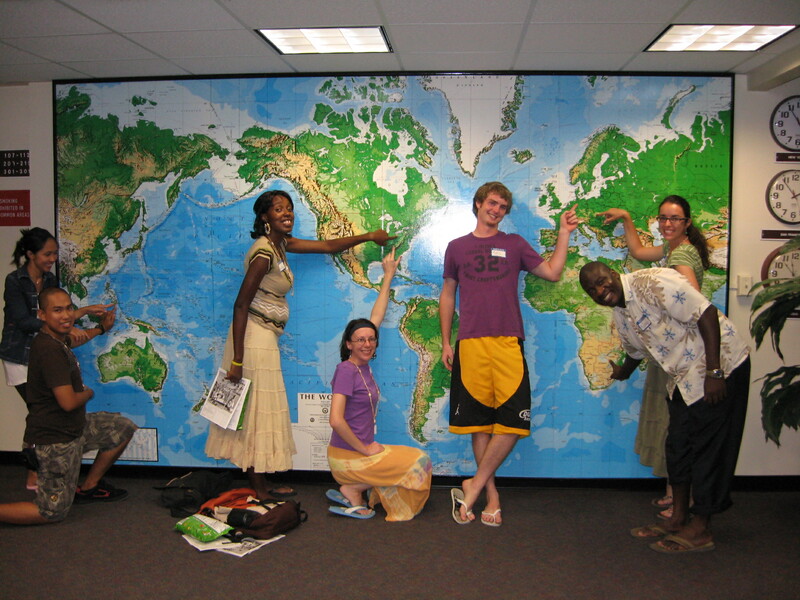 On a whim, someone said “everybody…go point to your country.” After getting back and putting everything together for these posts I thought, ‘God, you really know how to document a story.’ From Left, Philippines (Michael and Love), America (Trecie and Me), Germany (Malte), Africa (Nyasha), Slovakia (Lenka). Beautiful isn’t it? I love the diversity. It’s in unity that our diversity shines the brightest. There is a specific anointing that God has retained for bringing about unity…not just within one church structure but between denominations. 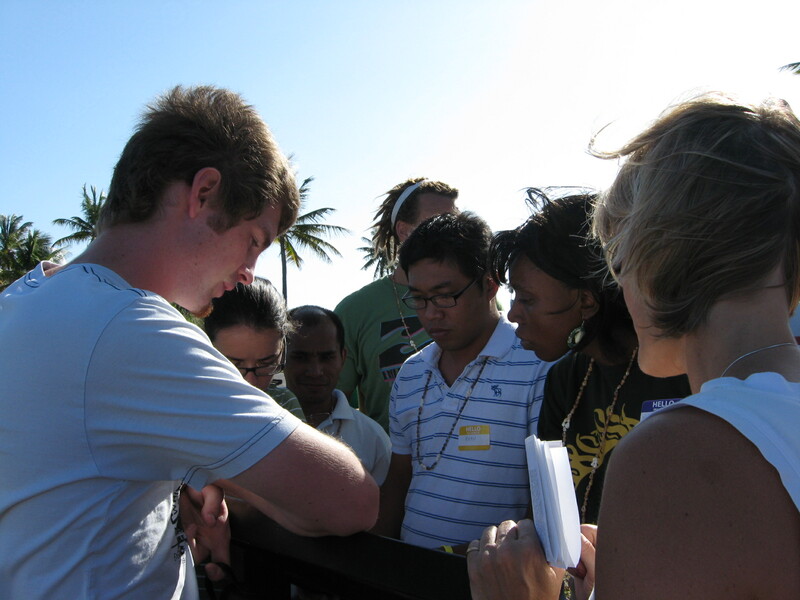 Before my eyes I saw multi-denominations, multi-cultural individuals coming together in unity, only within a 24 hour period, and God impressed upon my heart that our inability to cooperate with one another, failing to forge unity cross-denominationally, has held back a vast majority of blessing and power to the church. I know some may disagree, “we all are separate because we all have different ways we like to worship God”. And that has been acceptable, but we are going to strive for the blessing that comes from unity, that reaches to the other side and says, “we welcome you regardless of your individual worship style, as long as you celebrate Christ as your Savior”. God is big enough to take care of the rest. 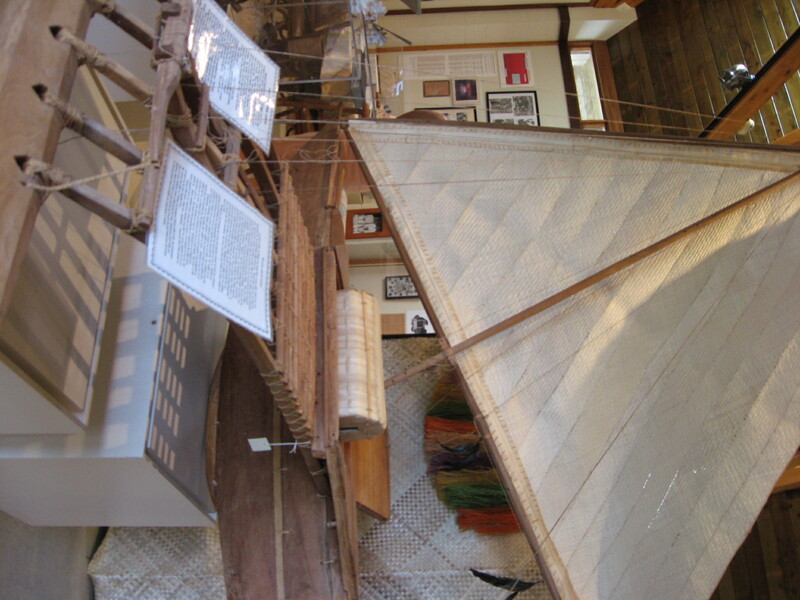 A model of one of the most important sea vessels in a family’s household, the Outrigger Canoe. This description gives the viewer an idea of the integral part ‘working together in unity’ plays in being successful and holding any family together, spiritual or natural. I would encourage you to click on the picture and enlarge it so you can read it as it complements the title acutely. 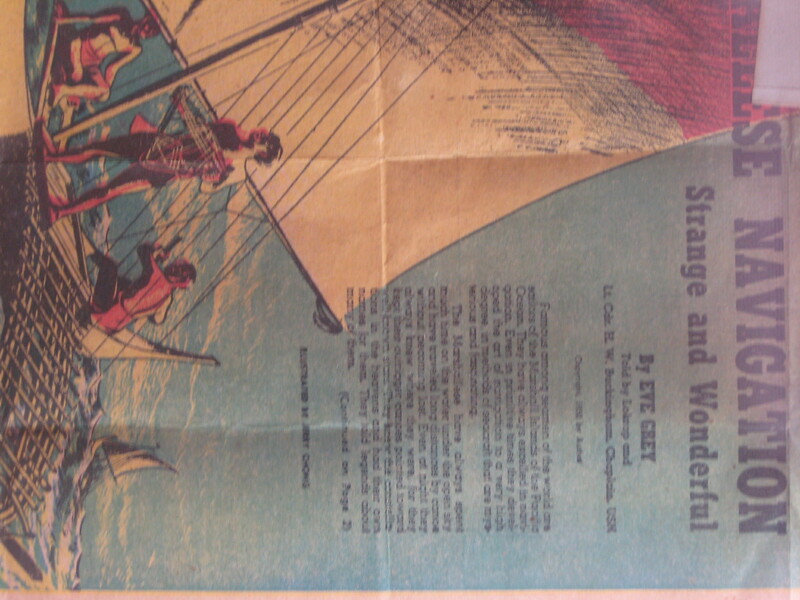 A front page article about the Strange and Wonderful Marshallese navigation. 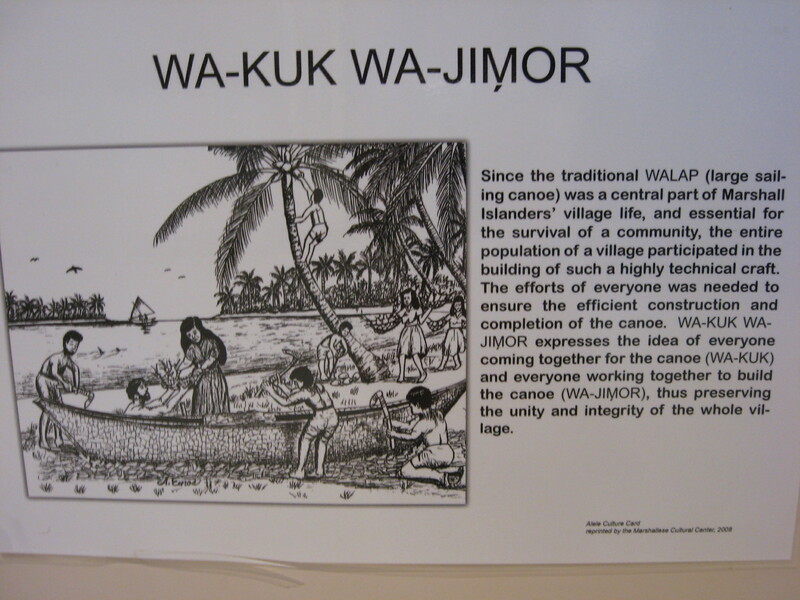 The canoe is illustrated. The date of the article was the year 1955. 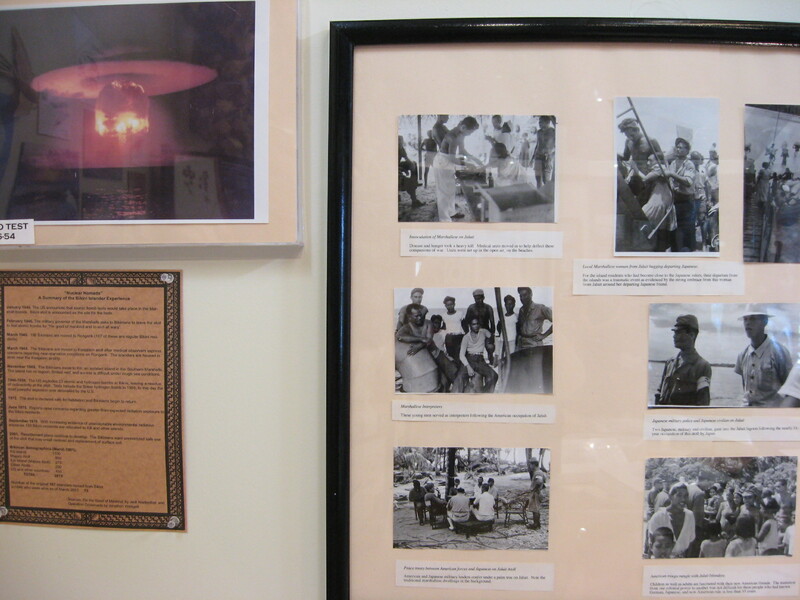 Here is a photo case of pictures taken after the battle for Kwajalein. Notice also the ominous red mushroom cloud looming in the upper left of the photo, foreshadowing a very horrific period of time to come. If you can enlarge and magnify the pic, there is an historical document below the photo that tells a brief history during that time. Ah, time to eat. 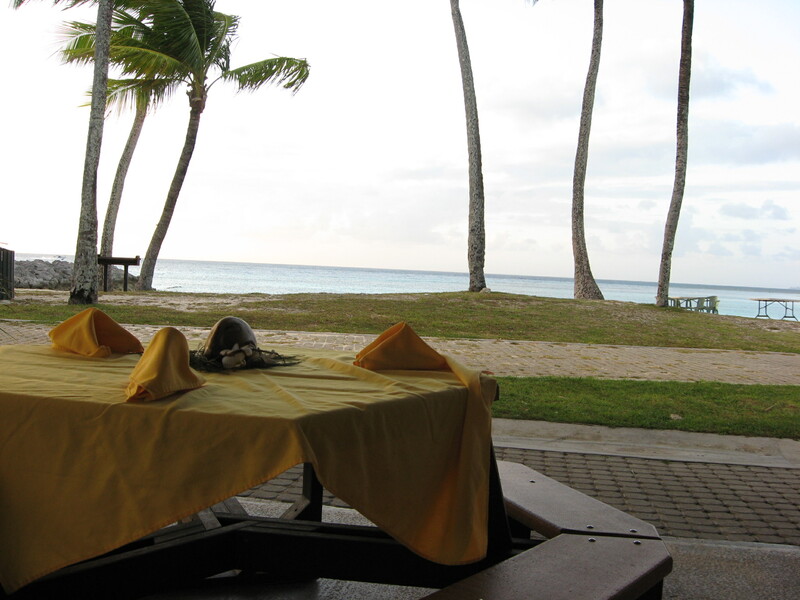 It was onward to dinner at Emon Beach where we all gathered to have wonderful fellowship and delicious food. 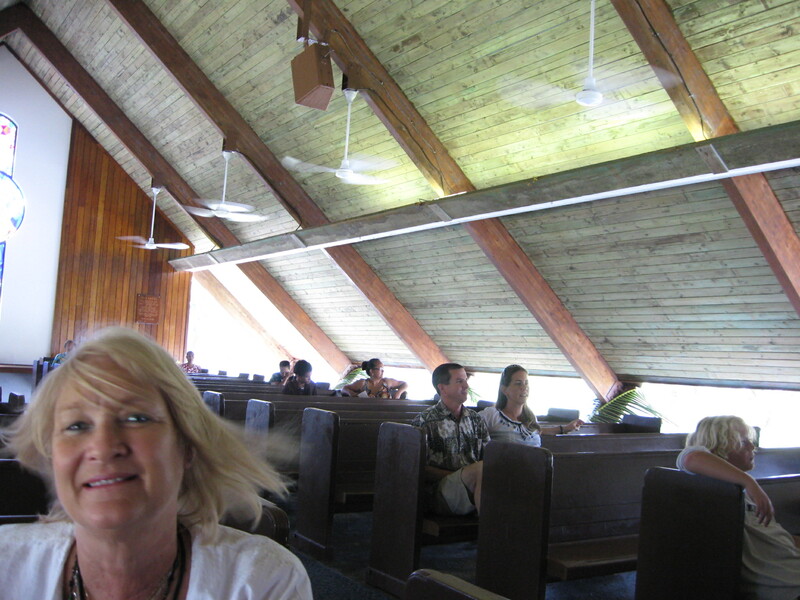 MaryLou, one of our hostesses and sponsors for the retreat. We all gathered for a group pic. Chatting after supper and listening to a Christian band. From left: Lenka, Malte, Treice, Me, John (our regular sponsor who just happened to stop in on the festivities). The evening came to a close and after walking through the soft sand on the beach, we all headed back to the hotel for some sleep. The next day would be filled (not necessarily in this order) with shopping, birthdays, breakfast, church and well…you’ll see :) I’ll pick up part three next week, continuing our journey of unity from a tiny island in the Pacific. God is a diverse God. He is multifaceted. The moment I try to search Him out is the moment I find myself with more treasures to seek answers too than when I first began. He is unfathomable and yet precisely simple. Highly exalted above all and yet found in the very tissues of the cells in our human bodies, giving life, exuding energy. He is the life and essence of the Christian. 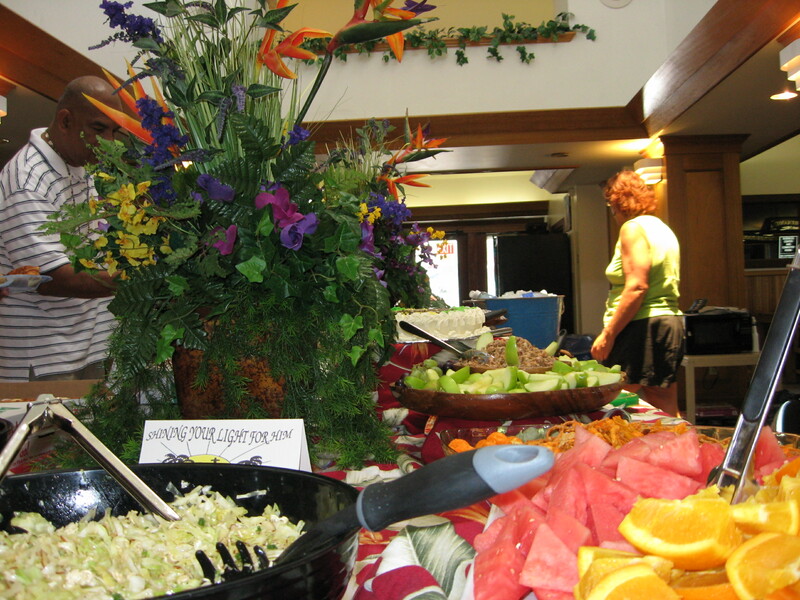 Day 1: We started off on Saturday with a huge buffet spread in the ARC (Adult Recreational Center). The selection was refreshing and we received a vast array of gifts such as magazines, lotions, books, a shirt with the theme of the retreat: Shining Your Light for Him, and many other goodies. What a blessing it was! 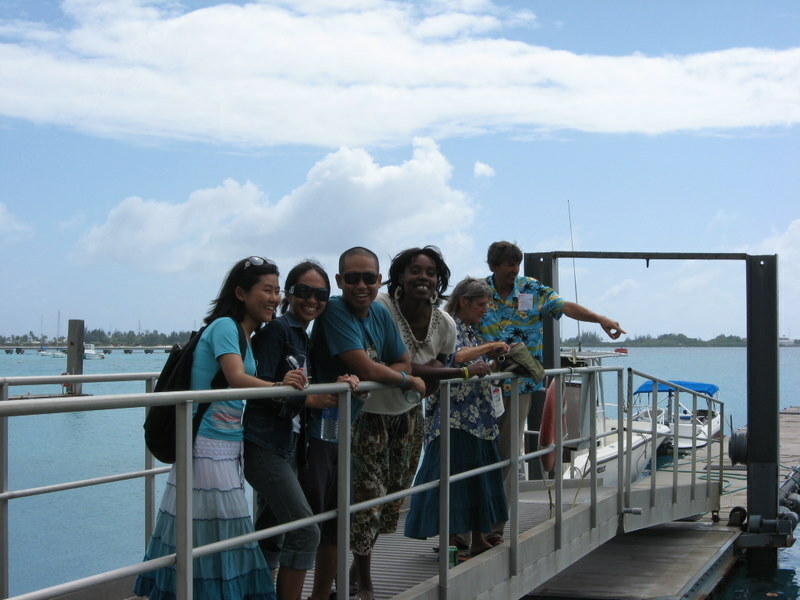 Everyone boarding the Jambo-Jambo (as the Marshallese call it) to begin the island tour. Our hearts were all immediately on the same page. God was in the midst of the group and we were already enjoying each others company. 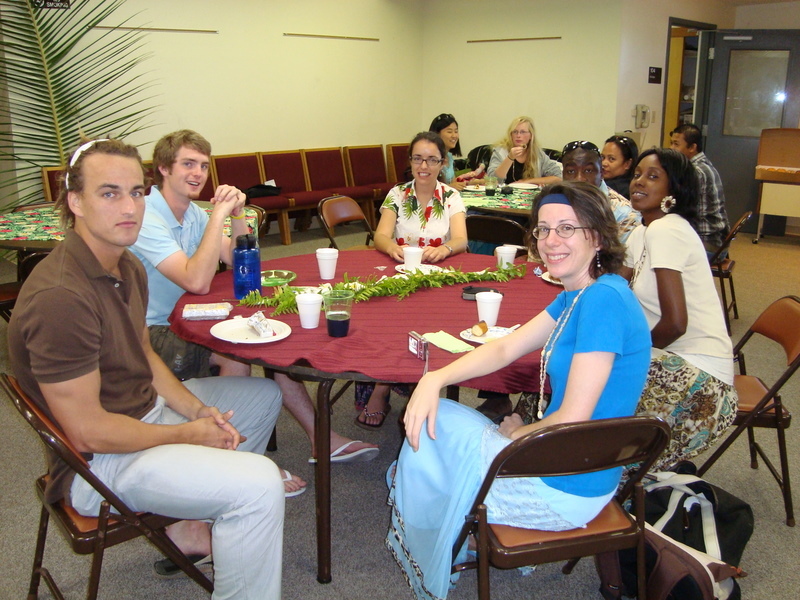 The missions group was comprised of about 20 Spirit-filled, on fire, energetic individuals who had one goal in mind…to eat and have fun fellowshipping together! And yet I saw, for a brief moment, a small replica of a huge expanding vision: Germans, Americans, Filipinos, Chinese, Slovakians, Africans…Baptists, Seventh-Day Adventists, Charismatics, Catholics… It’s amazing what a common goal and a little freedom and flexibility can do to bring people together. 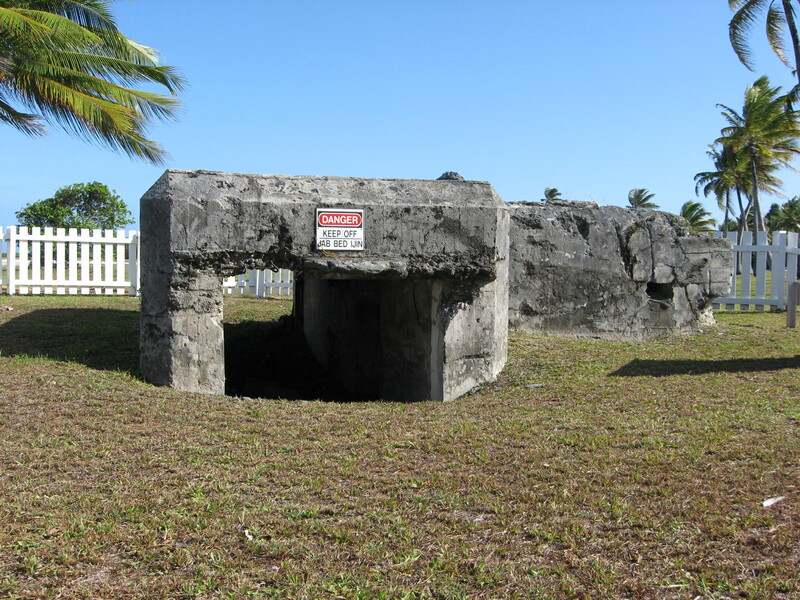 One of the first stops was a bunker that the Japanese used when American warships first began their push to overtake Kwajalein during WWII. 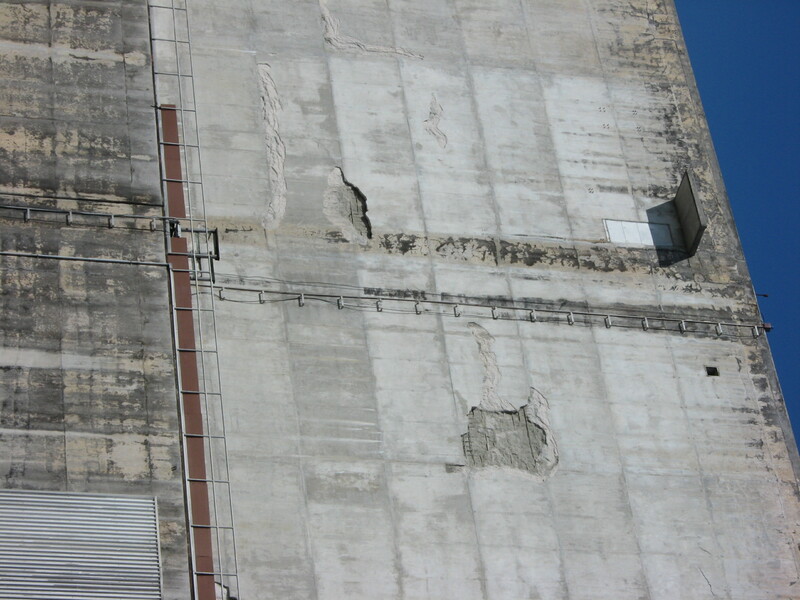 This bunker had several bullet holes in the concrete and was blown entirely off in some places. The island has many historical sites including where the first initial shots were taken when our troops landed in the amphibious assult. 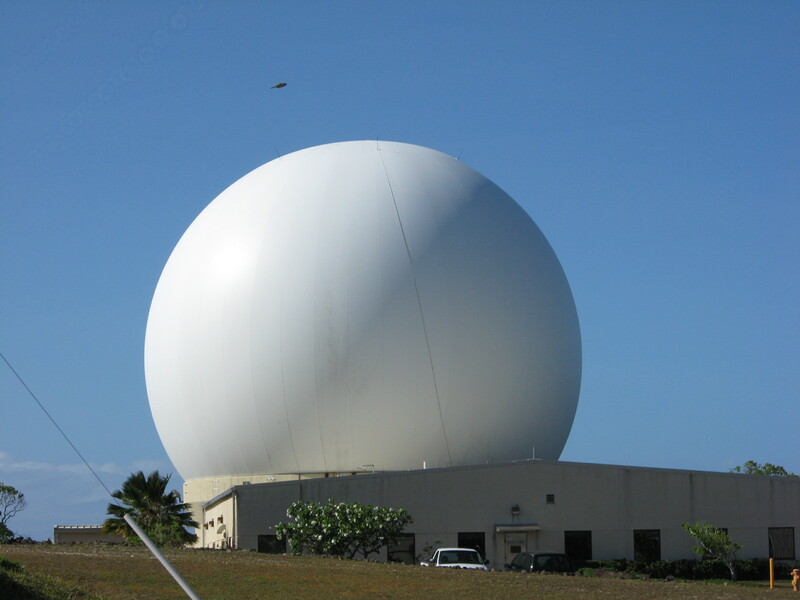 Japanese Pillbox which was reconstructed by the U.S. after heavy damage. 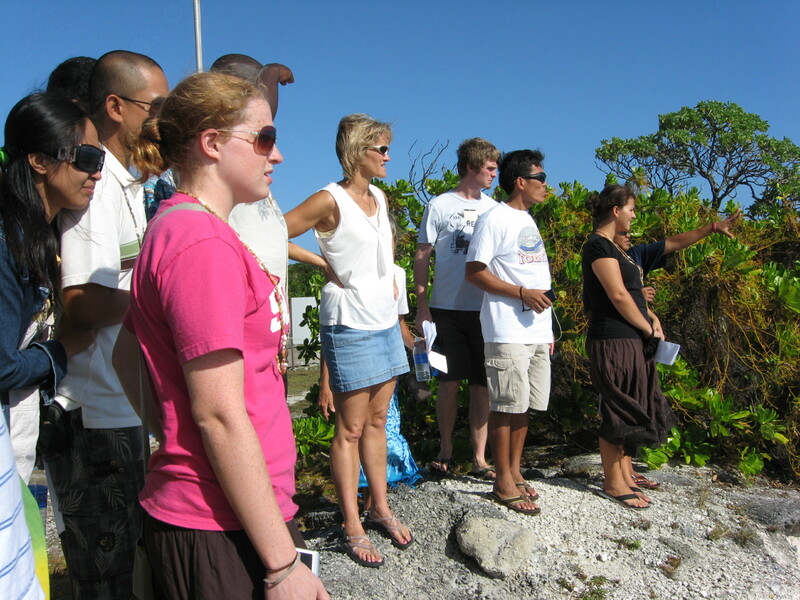 Malte (near left) and AnnElise (near right) discussing the map of battles in that area. AnnElise was a faithful, fearless guide throughout our entire stay. She was a wonderful hostess. 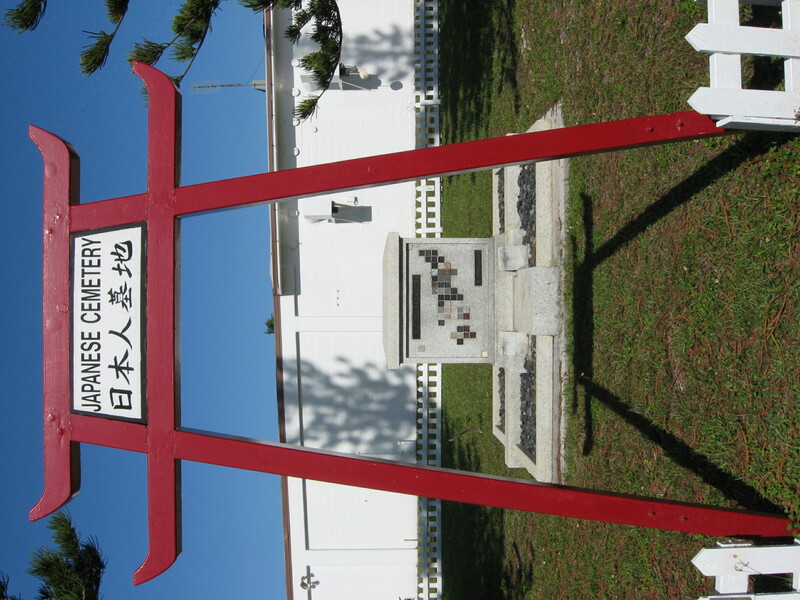 This is a Japanese Memorial dedicated to the nearly 3500 Japanese soldiers, sailors and airmen who died defending Kwaj. 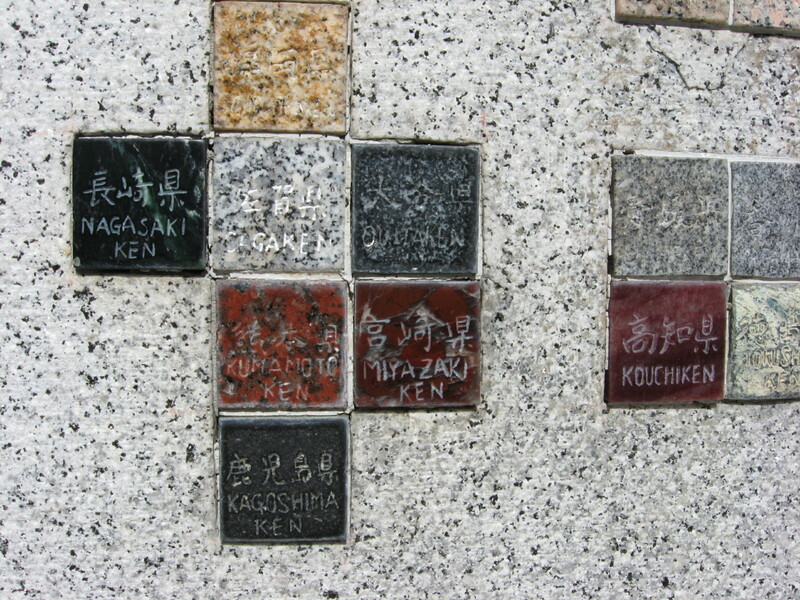 Detail of the stones with names of some who lost their lives. There were satellite globes everywhere it seemed. If you look closely, there is a rope that covers the entire globe. This was included so that snow could easily be swept off…go figure. Same principle applies below. See waaaayyy up there at the top, a door…with no steps to it? Yes, that door. Built to spec according to another warehouse facility in the states that was partially underground, so the door was functional, it left much to be desired here. This facility (the most expensive warehouse in the world) was built above ground…but no one questioned the necessity of a door at the top of a building with no way in or out. The group looking out over the ocean, Justin (not pictured) was interested in the surfing potential of this particular place…he deemed it worthy. 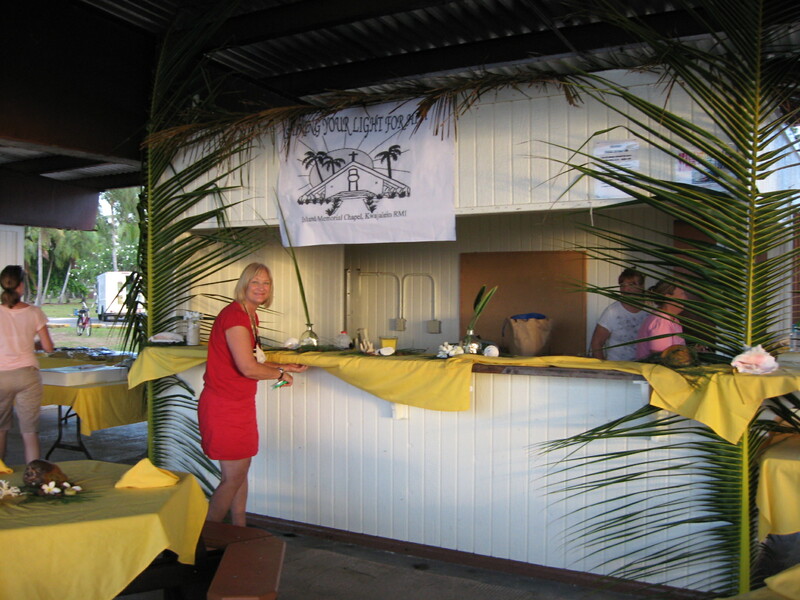 We cruised over in the Jambo-Jambo to the island Country Club where the Senior Prom was getting ready to be held. There was much decorating and chatting going on about the decorations. We stayed for a moment and then headed back to the hotel. From left, Lenka and Emily. 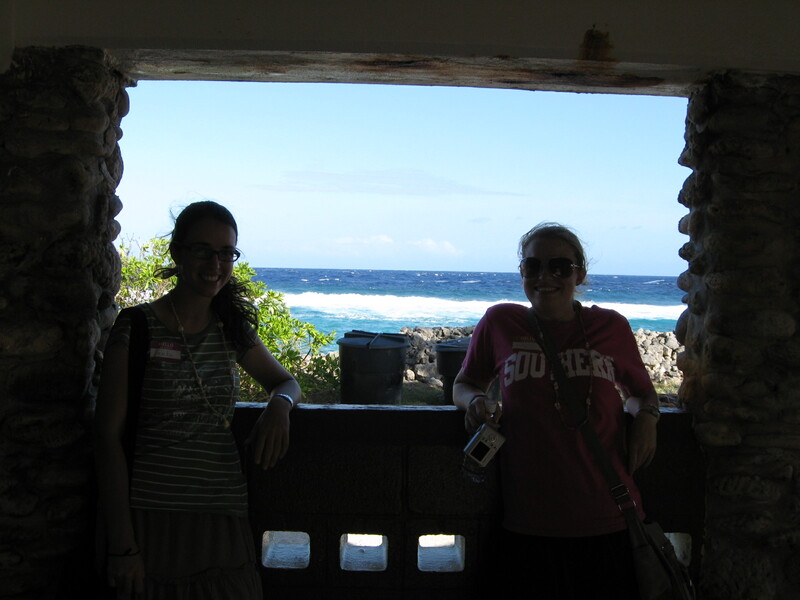 We got to check out the Marshallese Cultural Center and then back to get ready for the evening; dinner seaside at Emon Beach. But these events will be picked up next week in Part Two. 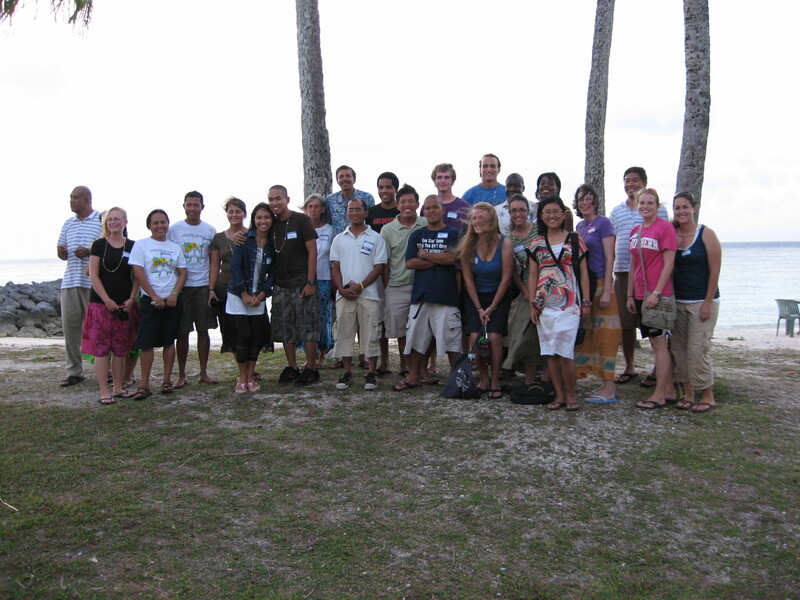 We just arrived back from our Missions Retreat on Kwajalein Island. There were so many precious moments to hold on to, reflections to capture, history to absorb, wonderful ‘kamaradstva’ (or Slovak for ‘friendships’) to remember which were forged in just over 24 hours – it’s amazing what God can do with people who are like-minded, on the same course, willing to tolerate and to always appreciate. In the next 2-3 days I will attempt to capture what was experienced these past couple of days. There was something God did for me that brought alive what He has been quietly speaking to my heart and I will attempt to capture what is in my heart and write it. If God is with me, I will be able to do it. If not, if the time is not right, then it will at least be a wonderful record of the people and our time spent together. 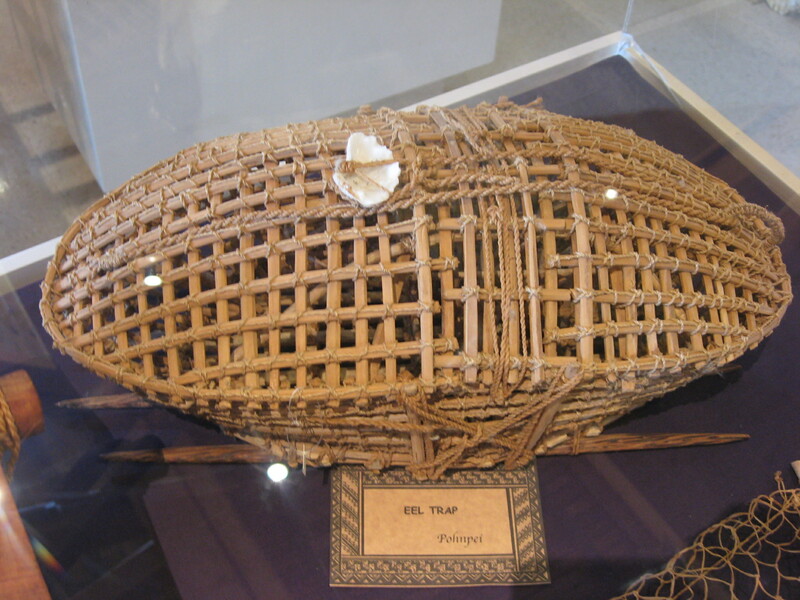 I will be using this blog to account for my own personal moments and to give you, the reader, a small glimpse into a little of the culture of the Marshall Islands (very small) but it is for my own purposes of remembrance. I hope you will enjoy them as well. I will likely have several parts to it as it is too long with too much to express for one blog entry. I thank God for the joy He has put in my heart! Without Him, I would be nothing. Oklahoma: 30 people were saved. Arkansas and Texas: 50 people saved and individually ministered to, 5 couples married. 15 water baptisms. 7 children dedications. One ordination for Pastor & deacons. One man had a damaged kidney. Pastor Hone and Mrs. Grace prayed over him and the next day he went back to the doctor and they told him the kidney was functioning properly with no signs of damage. Many people came to the meetings and some even drove from other states to come and receive from God. Honolulu/Maui: Pastor Hone was preaching when Mrs. Grace received a long distance phone call from Oklahoma; it was a deacon’s wife who said her husband was in the hospital in the ICU. He had plugs and hoses running in and out of him and she desperately requested prayer because he had stopped breathing on his own. Mrs. Grace began to pray and the wife put the phone up to her husband’s ear. As she prayed, the Spirit of God moved over this man and he began to breathe again. Halleluiah! 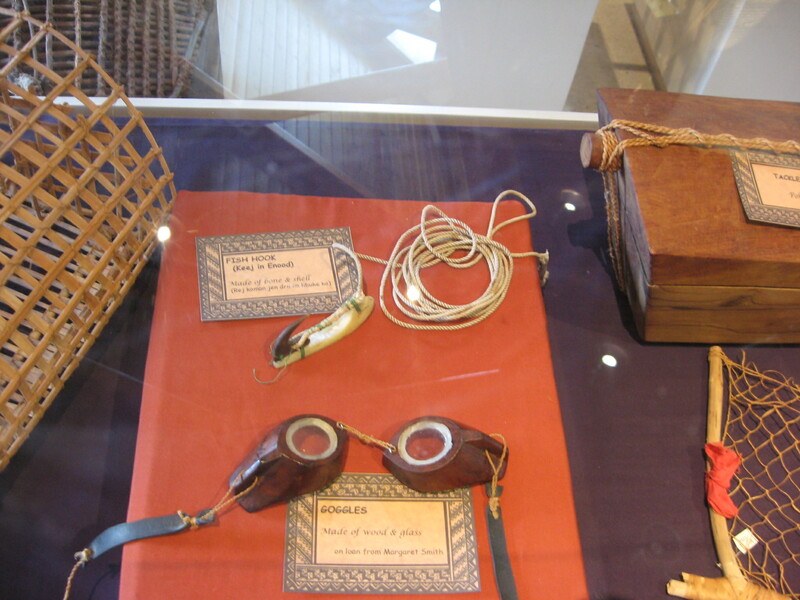 These are some of the events that were translated from Marshallese into English for me that took place over the 2 months they were ministering in the states. God is good. The school is currently on Spring Break for this week. 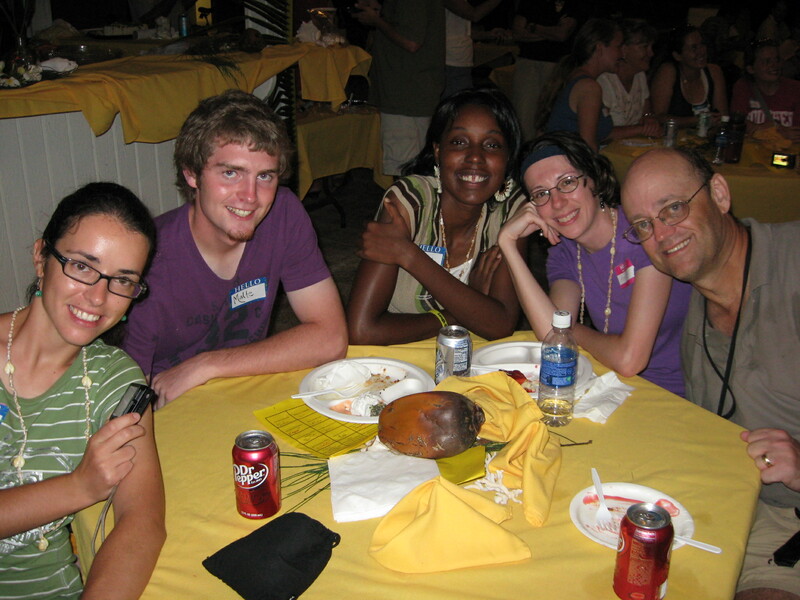 We have a Missionary Retreat coming up this Saturday which we are all looking forward too. A hotel room with hot water!! 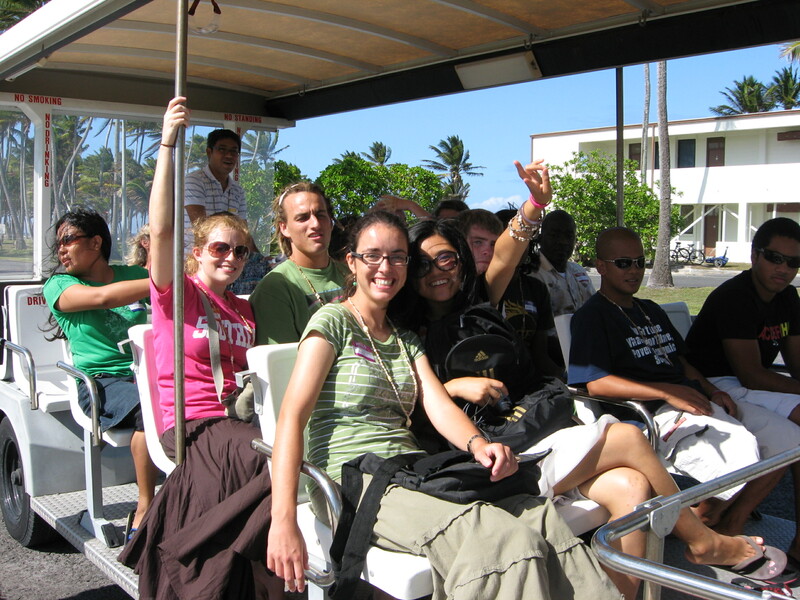 I’ll be sure to blog about meeting all the other missionaries from the outer islands and their experiences in the field.